Well today I am just so excited, yes I know, I always seems excited, I think it’s all the coffee I drink, but there’s reason to celebrate!! Can you guess why I’m so happy? Nope, not my birthday, nope not an anniversary, uh uh, I didn’t win the lottery. Keep guessing! Here’s a clue, it’s in this picture. Do you see what is making me so happy? Give up? It’s this!!! My beloved Trader Joe’s Frozen Yogurt is back!! I haven’t had this since September and it made me sad. I bought frozen yogurt once since than and it did not compare in my eyes. I love this frozen yogurt. It’s 100 calories for 1/2 cup, 0 fat, 13 grams of sugar, 3 grams of protein and 20 carbs. Ok, not the greatest stats, but it’s pretty good for 0% fat free frozen yogurt, trust me I checked. But most of all, I love the flavor, it’s kind of tart! If you like tart frozen yogurt, than you have to try my beloved TJ’s! Since I am so happy, I decided to do a giveaway. You know what I’m giving away? 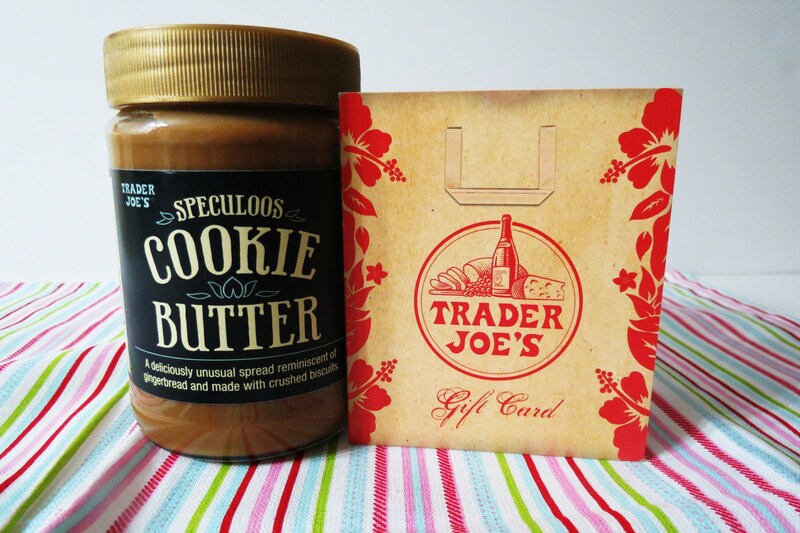 I can’t send you Frozen Yogurt, but I can give you a jar of the famous Speculoos Cookie Butter and a $25.00 gift card for my favorite store, Trader Joe’s! Now you can buy your own Frozen Yogurt and other goodies to!! You had to know that sooner or later I would be giving away a Trader Joe’s gift, after all it’s my favorite grocery store! To enter, all you have to do is tell me your favorite Trader Joe’s product. 5 Additional chances to win: Oh and be sure you tell me you did this. The giveaway ends on Sunday, April 15th, at 12 noon. I’ll pick a winner through random.org and announce the winner on Monday. Sorry, US only. Please note that this giveaway is on my own merit, no one offered me any products or money for this giveaway, this is all me!! Before I go, just in case you’re wondering whats on my ice cream. 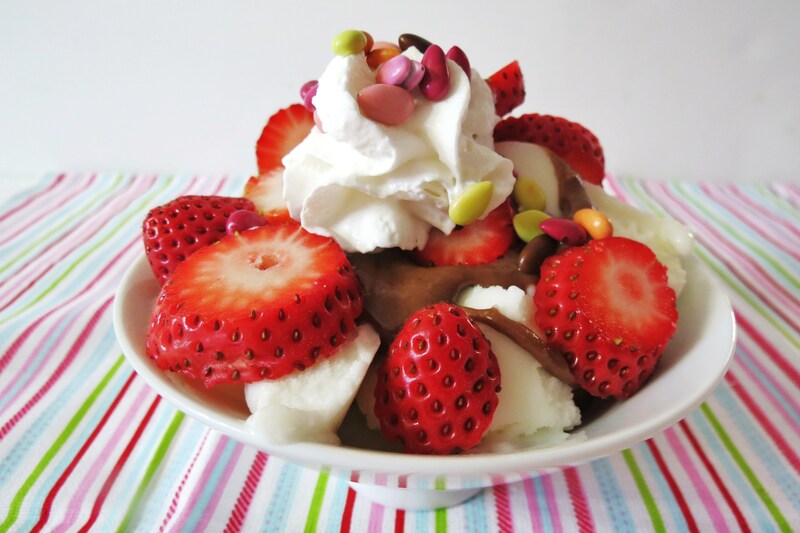 It’s Trader Joe’s Frozen Yogurt, Strawberries, my Chocolate Coconut Cashew Butter, Fat Free Whip Cream and Trader Joe’s Chocolate Sunflower Sundrop seeds. 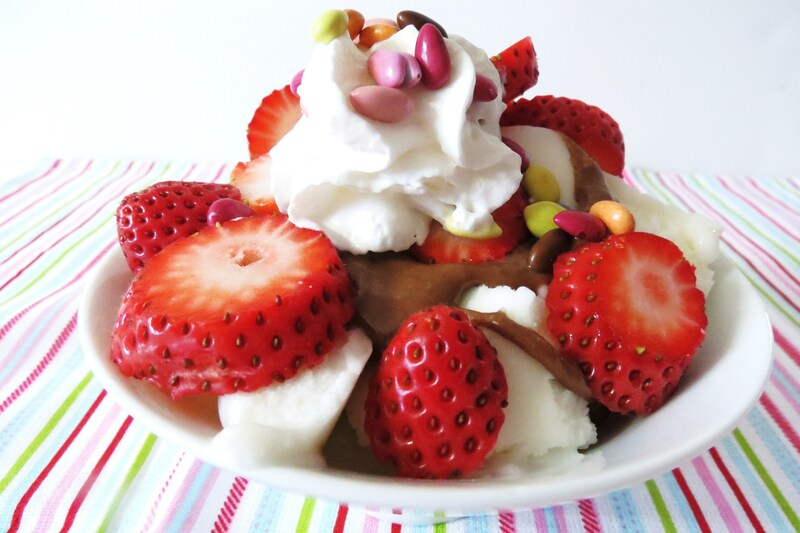 My favorite ice cream dessert! Sorry there’s no recipe today, but I have some really good recipes to share with you this week, two that I really love, so stay tuned! Now be sure to enter my giveaway!! Good luck! My favorite TJ product, by far, is cookie butter. So delicious! well since you obviously can’t ship the froyo, I’m going to have to investigate whether my store has it because it sounds AWESOME. Honestly, right now my favorite TJ’s product is the cookie butter! It’s addictive. My favorite Trader Joe’s product right now is their cookie butter. I am obsessed with it!! I have liked you on FB. I haven’t had a chance to try too many things there as they just opened in my town but I do love the chocolate lava cookies and the frozen gnocchi! I follow you on Twitter and visit this blog daily!! My favorite Trader Joe’s product is their Sprouted Grain Bread…that cookie butter would be an incredible addition :-). And, today is my birthday!! Follow you on FB, tweeted about it (@kellumkrew) and I love TJs crunchy almond butter with flaxseed!!! Yummo! My favorite Trader Joe’s product is their tricolor quinoa. So yummy!! I follow your blog! yay! I actually just went to Trader Joe’s for the FIRST TIME last weekend. I was in heaven!!! my favorite things are the Truffle Cheese (best. cheese. ever.) and the plantain chips. NOMNOM! I love TJ’s! I love any of their chocolate-covered products, but lately I’ve been gorging out on the edamame thin crackers and the toasted coconut thin cookies! I don’t have a TJ’s so every time my mom visits, she brings me a goodie bag of treats from them! That cookie butter! OMG! It is like crack to me!!!! I love the Trader Joe’s flax seed tortilla chips! Yum! Practically all of their products are amazing! My favorite TJ product is their dark chocolate covered pomegranates! They are so tastyyyy! I really like the frozen yogurt, too. But my FAVORITE product is probably the cinnamon cats cookies. I can’t even pick!! I do know that I’ve been lusting after that speculoos spread, I’m also in love with any of their cheeses and olive oils, and really….everything! Thank you for the giveaway. Love Trader Joe’s fresh produce and flowers! I also have this awesome teriyaki stirfry sauce from Trader Joe’s that I use at least once a week. I now subscribe to you through email. I now follow you on twitter also. Lastly I like you on facebook. Thanks again for the giveaway! I don’t have a Trader Joes :-(. But there is one 3 hours away in Nashville I went to once and I fell in love with their chocolate peanut butter cupcakes! Ooooh, this looks fantastci! And I looove spekuloos/Biscoff! My “faves” list for Trader Joe’s is huuuuuuuuge, but one thing that remains a consistent favorite is their hummus! Any flavor – love it all. Yay!! That’s great that they brought it back. Good frozen yogurt is tough to come by. One of my favorite products would have to be the greek yogurt. I love it! I use it so much in cooking and sometimes for breakfast with granola on top and even for dessert! It’s fantastic. I tweeted about the giveaway @cassandrabish! I would love to put you on my blog but I don’t have one… I was thinking about making one sometime soon though. Maybe when I’m out of school! my fave is their Thia noodle salad with ginger-cilantro dressing. makes me sad when they stop carrying it. Although… now that you remind me, my friend said she saw it again. Okay, hitting her up to have me pic some up. Need some of that cookie butter there. My most favorite TJ’s product is shelled edamame. I signed up for emails! Trader Joe’s pumpkin ice cream is kind of fantastic, though that frozen yogurt sounds good, too! I’m just entering for the prizes, I don’t know how that works. what a GENEROUS giveaway! my favorite TJ’s product is there veggie chips. with a whopping 27 per serving, they are amazingly delicious and satisfying. tastes just as good as any greasy LAYS chip, if not better! My favorite Trader Joe’s product is their HighBrow Chocolate Chip Cookies. I’m a fan on FB too! OBSESSED with TJ’s almond butter! I put it on everything! My favorite item at Trader Joes is their “Reduced Guilt” frozen mac & cheese dinner! I love a lot of their stuff but I I guess “2 buck chuck” is tops! I subscribed to your blog via email! I’ve never been to Trader Joe’s before! But I’m moving in two months so I will try to get there when I can! If it’s where I will be stationed! Like you on FB, too! I loveeee Trader Joes! They have the best variety of tortilla chips and hummus. I love their frozen salmon burgers, too. my favorite TJ product is the flax seed tortillas and chocolate almond butter! delicious! I love that store and your e-mails!! Cookie Butter! How oh how have I never heard of this?!?! I like the pita crackers from TJ’s. They’re my fav. My favorite TJ’s product is their sweet and hot mustard. YUM!!! With all of those goodies I couldn’t tell which item was making you do the happy dance! Glad your fro yo is back! My favorite TJ product is their Fruit & Nut Medley cereal! What an awesome giveaway. TJ’s is my absolute favorite store too. I’ve never had their frozen yogurt but I’ll be sure to try it. I love the Aioli Garlic Mustard! Whhhaattt I have been looking for this at my Trader Joes and its never there! I have been dying to try it ever since you mentioned it. Hopefully it will magically appear there one day and I will be able to try it…all of their other ice creams have so much fat booo. I love the ginger cookies! i would love to tell you my favorite product but I haven’t yet shopped at TJ! Awesome giveaway girl! My favorite TJ product would have to be their Dark Chocolate Covered Espresso Beans. MMMMM! I follow you on Facebook! You’re recipes and ideas have helped a lot now that I am trying to live a healthier life without loosing the good tastes I love. Thanks so much! I follow you on twitter and facebook. My fave from TJ’s is the healthy 8 salad. So fresh and crunchy. I will have to try the frozen yogurt. How can I pick just one fav TJ’s prod… Hmmm… we like the TJ’s JoeJoe’s especially the Christmas ones – so, so yummy (that’s my college daughter’s fav.) but my ultimate TJ’s fav would have to be the Mediterranean Hummus – it’s to die for! I could eat the entire tub in one sitting with a bag of fresh green beans – yummy! Good Luck Everyone! I have so many TJ’s favorites, but one of them is their Lemon Pappardelle Pasta-it tastes like homemade! I can’t wait to try this yogurt now too! Thanks for the giveaway! I subscribe to PB&P via email! I LIke PB&P on Facebook! OMG, I love the cookie butter! Amazing!! My favorite Trader Joe products are their chips! I’ve only been there a few times for snacks! I like Peanut Butter and Peppers on FB! I love the dark chocolate mints from TJ’s! My favorite thing at Trader Joe’s are the dark chocolate covered pretzel crisps. They are so good! But they are definitely only a once-in-awhile treat. More regularly, I buy the Cilantro-Jalapeno hummus. That is our household’s favorite snack. I have liked you on facebook!! I love the Pineapple Salsa. My favorite is honestly that broccoli slaw!!! I can eat way too much of that! Yum!! The kiddos love the Chocolate Covered Peanut Butter Pretzels. It’s a staple for every shopping trip. 🙂 Contest tweeted and liked on FB. I’m already subscribed to the blog via email! thanks so much for all the great ideas. Yay!!! Well I don’t have a TJ by me (one is opening close to me sometime this month!!!! EKK), but I’m sure my favorite would be the cookie buttah. I have so many favs…LOVE their gingerbread men cookies at Christmas! Love TJ’s. Not sure what cookie butter is. They have these cranberry dunkers with icing that ate amazing! Following your blog via email. I’ve been looking for this!! I hope NYC gets it soon. I loved their Curry Chicken Quinoa Salad but that has disappeared from shelves too. And i’ve been loving the toasted coconut cookie thins I got in my foodie pen pal exchange. Always on my TJ’s list though is gluten free rolled oats and creamy hummus. I am following you now…can’t believe I wasn’t already! I love Trader Joes. I have lots of favorite items from them. Candy Cane JoJos at Christmas are great. Year round I love the maple cookies, mochi ice creams, their greek yogurt, their cottage cheese, burrata, Asian frozen dinner items, and lemon pepper pasta. YUM! Subscribed in my Google Reader! I LOVE Trader Joe’s Burrata… if you haven’t tried it, you definitely should. It’s fresh Mozzarella Cheese filled with cream! 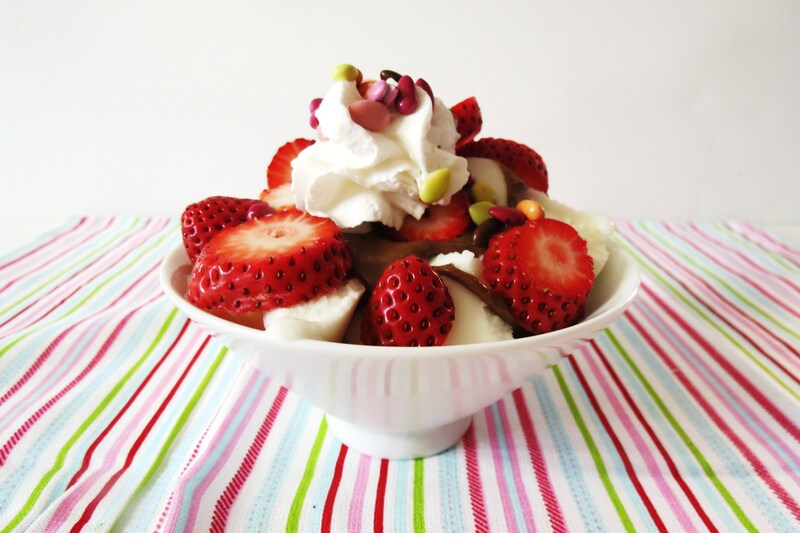 Love the Greek yogurt! I enjoy your blog very much. I love Trader Joe’s Chocolate Chip Dunkers cookies, yum! Favorite thing at Trader Joe’s is, hands down, their Oatmeal Soap Bar and organic raw walnuts!!!! Amazing and best deal around. Their almond butter – crunchy and unsalted! It’s the best almond butter I’ve had! I go through it so fast. I follow you on pinterest, too. I drool over your pins! Trader Joe’s is opening around the corner from my house next month!! I don’t even know what my favorite product is…yet!! I love TJ’s smashing smores and their sharp cheddar pub cheese! For me, it’s a toss up between the chocolate cheddar cheese and of course, cookie butter!! I’ve always wanted to try TJ’s products but never have. The Cookie butter would be my first try! Liked you on FB. Great giveaway! I love TJ Almond Butter!!! 1. Love so many products, but obsessed with the Cheese Sticks! 4. Liked your FB page. My fav TJ’s item is their chocolate covered almonds with Turbando sugar and sea salt!! Salty-sweet combo is amazing!!!! I love the chana masala veggie burgers! favorite TJ’s product? cocoa almond spread! that speculoos butter is amazing too! Followed the blog via email. Cute giveaway! I’m glad your frozen yogurt is back. My favorite Trader Joe’s product is their raw almond butter. It’s perfect. I haven’t had that cookie butter yet! omg no! My favorite is the Pineapple salsa! 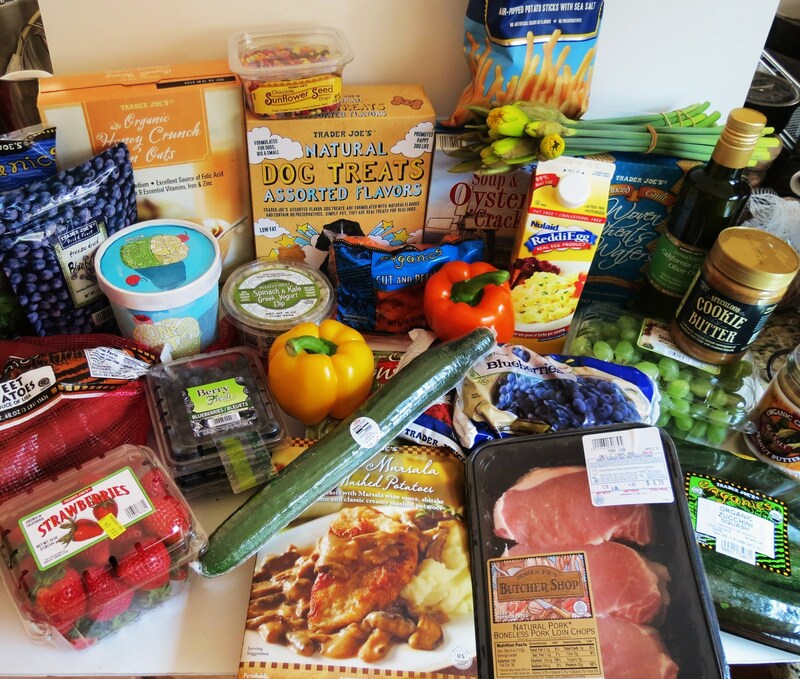 I put it on everything, omelettes, cottage cheese, salads…. sooo goood. And liked on Facebook ! I love the TJ’s canned shrimp!! I am following You by em…. look forward to it! you don’t need to post when you are approving, this is just for you 🙂 but I have an awesome giveaway going on too…. I love their windmill cookies and veggie Indian burgers. Thank you so much for the opportunity to win…I’m a new found love of Trader Joes , just recently I went to it for the first time and bought me some Simply Chocolate Bars. I never knew of the store until a friend told me about it. Well hun I think I did everything you said except tweet..Sorry I’m not a tweeter. =) I have four kids and it’s hard enough to stay updated on Facebook. I did the following….. I LOVE their chicken apple sausages, but pretty much everything TJ’s has I love! I’ll take a bowl please!!! I’ve actually NEVER been to Trader Joe’s, but I’m DYING to go!!!!!! I “liked” PB & Peppers on facebook! My favorite TJ product is… oh man, there are so many… I think I’ll have to pick the Greek yogurt! I am a sucker for those. Plus they aren’t expensive at all. But really I love just about everything TJ has! It’s my favorite store. My favorite TJ product is their sunflower seed butter! YUM! 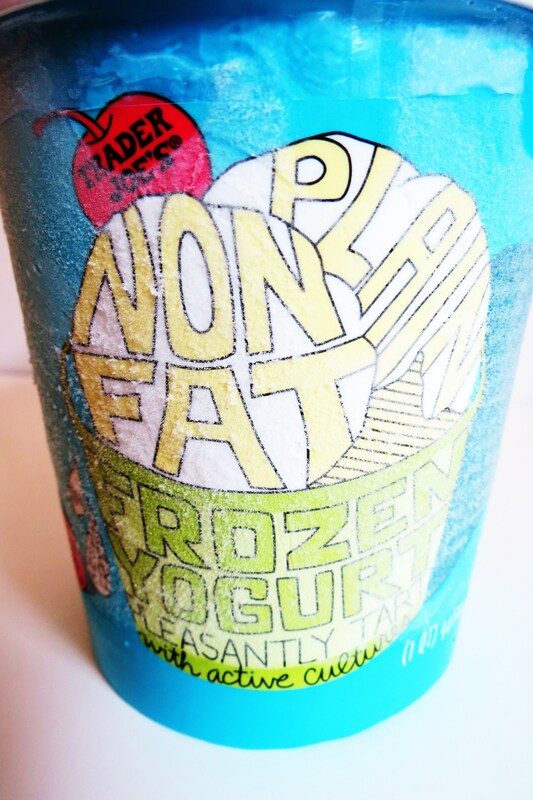 My favorite is nonfat frozen yogurt. I have never tried cookie butter but it looks pretty cool. 🙂 I miss living close to Trader Joe’s! My favorite is their cookie butter! Annnd I like you on Facebook now! Hmmm, fav TJ’s product…so many and so hard to choose just one. I just love the Speculoos Cookie Butter, we also love the sweet potato knocchi, cranberry-orange mini scones, non-fat French Village Vanilla yogurt. Oh, I could go on and on. BTW… I moved and now live 30 miles from TJ’s. I still drive there once a week. Now following you on twitter: Sharksgirl213. Go San Jose Sharks!!! Great giveaway! I love so many things at TJ’s. My favorite product is probably their meringues – they discontinued the chocolate but the vanilla ones are really delicious. I “liked” you on fb! I absolutely love Trader Joe’s crunchy peanut butter and their almond milk! my favorite TJ’s product is the organic 73% dark chocolate… i know a dark chocolate bar is nothing unique… but all that rich, intense flavor for $1.99 leads me to pick up a bar during each visit! i am a facebook liker, twitter follower, and subscriber! I love their organic butter. It’s the best and so affordable! My favorite Trader Joe item is in the freezer section. It’s a piece of meatloaf with a dollop of mashed potatoes on top. Looks like a cupcake and it tastes so good.